Honor just unveiled its latest smartphone, the Honor View 20, to rapturous applause at a media event in Paris. The latest handset is squarely targeted at the likes of the OnePlus 6T, Samsung Galaxy A8s, and other hugely-popular mid-range handsets. Like the rival Galaxy A8s, Honor is using an all-screen design to squeeze as much screen real estate as possible into a phone that remains small enough to use one-handed. To do that, the company has embedded the front-facing camera into a 4.5mm circular cut-out in the top left-hand corner of the 6.4-inch LCD display. Samsung is expected to use a similar approach with its upcoming flagship, the Galaxy S10. While rival manufacturers, like OnePlus and Xiaomi, have favoured a notch at the top of the screen and a sliding drawer mechanism to house the camera and other core components, respectively. When placed side-by-side, there is something very appealing about the hole-punch style screen design of the Honor View 20, which has resulted in an incredible 91.8% body-to-screen ratio. Of course, if you're not a fan of the look of the Honor View 20 design, it's possible to hide the small circular hole in the upper left-hand corner using software. Honor lets you add a black border that runs the length of the top of the display that covers the front-facing camera – although this will inevitably reduce the amount of usable screen real estate available on your device, it will bring back some symmetry to the front of your phone, if that's your bag. Thankfully, the fact that the front-facing camera is buried inside a small opening in the screen does not mean Honor has had to sacrifice the resolution of its sensor. The View 20 has a capable 25-megapixel sensor peering out through the 18-layers that make up the LCD display. Honor has also added a ton of AI smarts designed to help users salvage the best possible shot at every available opportunity. There's also Augmented Reality (AR) emoji akin to Animoji on the iPhone, which superimposes the animated character onto your face and mimics your facial expressions. The Honor View 20 can also change the background in real-time to transport you to a foreign location. Flip the smartphone over and you'll find a monstrous 48-megapixel camera. According to Honor, this sensor can produce so-called “Super 48MP Photos”. These images are enhanced using the smarts of the Kirin 980 chipset, which was one of the headline announcements from manufacturer Huawei during its IFA press conference last year and powers the Mate 20 Pro – our favourite Android phone money can buy. 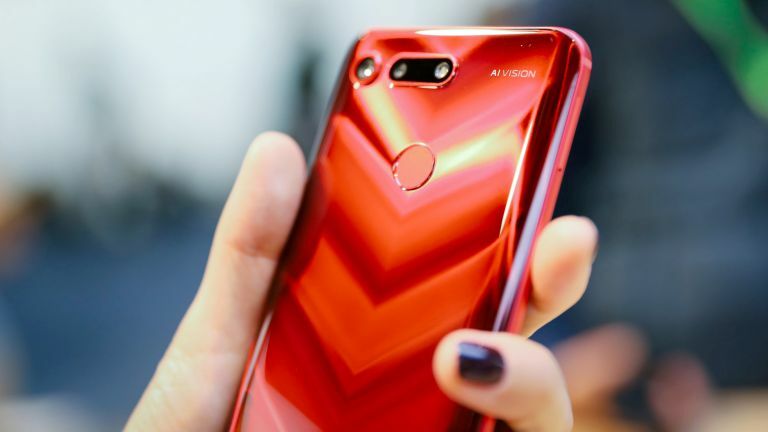 According to Honor, the flagship silicon inside the View 20 is capable of enhancing any dim and blurry segments in the image "to create more vivid colours and sharper images". Dubbed AI Ultra Clarity, the automatic enhancements can be ditched in the settings menu. The handset also ships with AI Photography Mode, which can be enabled from the same settings menu, and automatically detects which objects are in the frame and (supposedly) optimises the camera settings accordingly. We'll have to spend some time with the phone to test out the capabilities. The Kirin 980 chipset is coupled with 8GB of RAM, and 256GB of non-expandable storage. Similar to the latest offering from OnePlus. For those who want the maxed-out variant with 8GB of RAM, and 256GB of storage, the company will be charging £579.99. This flagship model ships in an exclusive Phantom Blue and Phantom Red finish, created in collaboration with Italian fashion brand Moschino. Those who purchase or upgrade to the new handset at Carphone Warehouse will receive a free Honor Watch Magic worth £179.99. The promotion ends February 6, 2019 and can be redeemed via the Honor website.